get ready for a makeover. 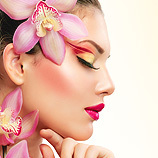 Stay updated with our online guides to enhance your natural beauty and boost your self-confidence. Win-win! Good skin starts with a good regimen. Learn skin care techniques and what to do with problem areas. Look amazing with a splash of color in all the right places. Here's how to apply makeup to define your finest features. Treat your tresses with TLC and you’ll enjoy hair that’s more manageable, shiny, and naturally healthy. Photo-op time! Here's how to make friends with the camera and put your best face forward with a few tricks to look picture perfect. Want to look fresh and flawless? Forget a makeover. We'll help put you on a path to a beautiful, unaffected, you. Naturally. Get ready to turn back time! We've got some practical ideas to take years off of your appearance and fool even the most intuitive people. Go! Here's all you need to look simply stunning on your special day. Makeup, hairstyles, and more. Because it's all about you. Whether long or short, find out the top choices for a popular cuts, color, and hairstyles. Here's what's trending for the cold season. Not sure where to get started on your goals for the New Year? Here's why many resoutions fail and how to get motivated to make your's a reality!